Escape@Butterfly - Marloth Park Accommodation. Escape@Butterfly is a brand new thatched roof house situated in the popular Marloth Park Conservancy, just outside of the Kruger National Park. It is a two bedroom house with an upstairs loft area. The main bedroom has a queen size bed and an en-suite bathroom with a bath, shower, basin and toilet. The second bedroom has a queen size bed. There is a second bathroom fitted with a shower, basin and toilet. The loft area has four singe beds. All the beds have percale linen and bath towels are provided. The house is fully equipped for self-catering (including a dishwasher) in the spacious kitchen with all modern cooking appliances and facilities. A breakfast bar forms a border between the kitchen and lounge area. The lounge has a TV with selected DSTV channels and comfortable sofas. Outside is a very spacious, covered and private entertainment area with a swimming pool and braai. Parking for 2 vehicles under a thatch carport. 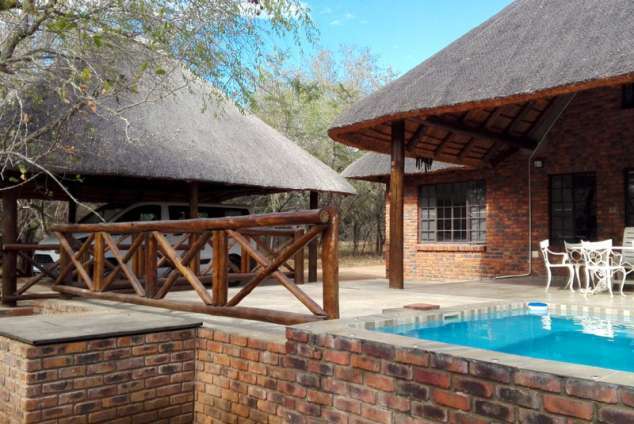 Experience the African Bush with wild animals passing by as you sit in the pool. The house is very private with bush around the property. It is ideal for families and groups looking for a spot where you can enjoy game viewing, without even having to leave the property. Marloth Park is a wildlife Conservancy where Giraffe, Kudu, Warthog, Zebra, Impala and countless other wild animals roam free between the properties. Escape@Butterfly is visited daily by Zebra, Kudu, Warthog, Impala and Bushbabies. Within Marloth Park there is the Lionspruit Game Reserve where there are Lion, Buffalo and Rhino. The Crocodile river separates the Kruger Park from Marloth park. Within Marloth there are look out points all along the river where you see into the Kruger, and where the Elephants, Lion, Buffalo, Crocodile and Hippo come to drink daily. Detail description : Wild animals roam around the park freely. Zebra, Kudu will come and drink out of the swimming pool at the house. 5858 page views since 20 Jul, 2015.